Main Category: Wholesale Raffle Drums & Supplies | Material: Acrylic | Hayes Specialties Corp. 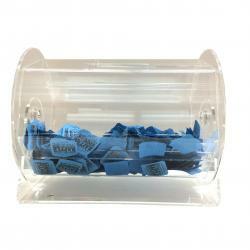 The Small Acrylic Raffle Drum holds approximately 2000 tickets and measures 9&rdquoD x 11&rdquoL x 9&rdquoH. 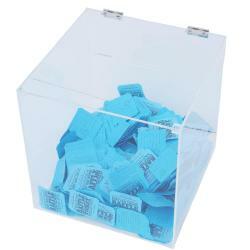 The Medium Acrylic Raffle Drum holds approximately 5000 tickets, spins freely with no handle, and measures approximately 11&rdquoD x 15&rdquoL x 12.5&rdquoH. 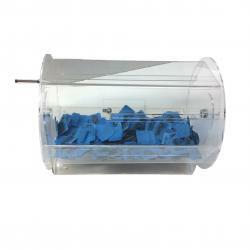 The Large Acrylic Raffle Drum holds approximately 15,000 tickets and measures 11.75&rdquoD x 24&rdquoL x 14&rdquoH. The Acrylic Ticket Box measures 10 x 10 x 9.5 inches with the slot on top measuring 4&frac14 x 7/16 inches and is great for collecting tickets or business cards. 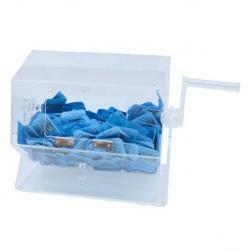 Easy removal with the hinged lid.